Radiesse volumising dermal filler puts back volume exactly where it was by restimulating natural collagen production. 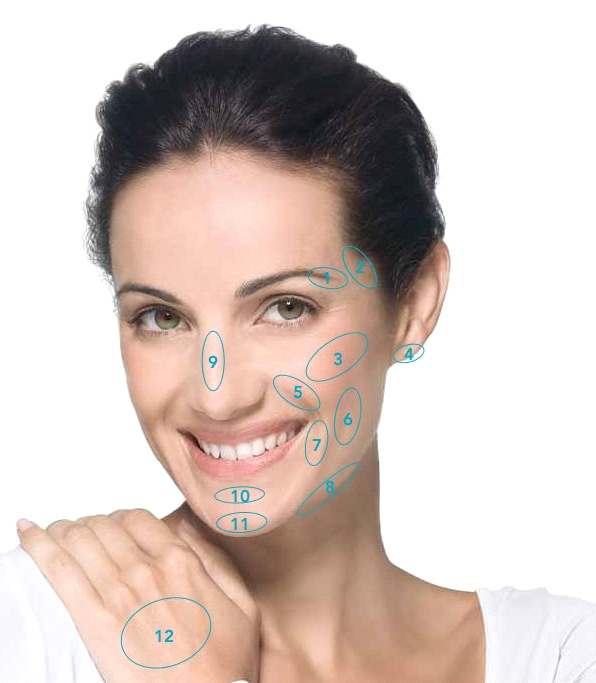 Deeper wrinkles and hollow or sagging cheeks disappear, and the natural facial contours return. Radiesse Volumising dermal filler can lift your eyebrows to make your eyes appear open and fresh. Hollow temples can be filled out to give your face a fuller appearance. Volume in the cheekbone strengthens the ‘V’ shape of the face and shapes a youthful appearance. Volumising dermal filler can help restore the fullness and smoothness of the earlobes. The folds between the nose and corner of the mouth, also known as the ‘laugh lines‘, are often the most noticeable lines. They can be filled out easily, giving you a fresher and younger look immediately. With the V Effect, lost volume in sunken cheeks can be replaced effectively. These are the lines that go from the corners of the mouth down to the jaw. With the marionette lines filled in you will gain a cheerful expression. Defined contours on the lower jaw help to maintain the youthful ‘V’. Nasal imperfections can be reshaped and smoothed out with volumising dermal filler without resorting to surgery. A sunken chin fold can be filled in defining the base of the ‘V’. Volumising dermal filler helps to achieve a natural expression, defining the jaw line. Veins and bones are more clearly visible with age. Retain a youthful appearance by plumping the back of the hands.